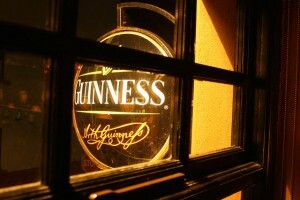 For many years Guinness achieved its place as one of the world’s largest brewery by specializing in one product. Although there were a few variations, for the most part if you just ordered “Guinness” you would know what you would be served. Its success stemmed in part from an aggressive and skilled marketing approach in much of the non-European world. 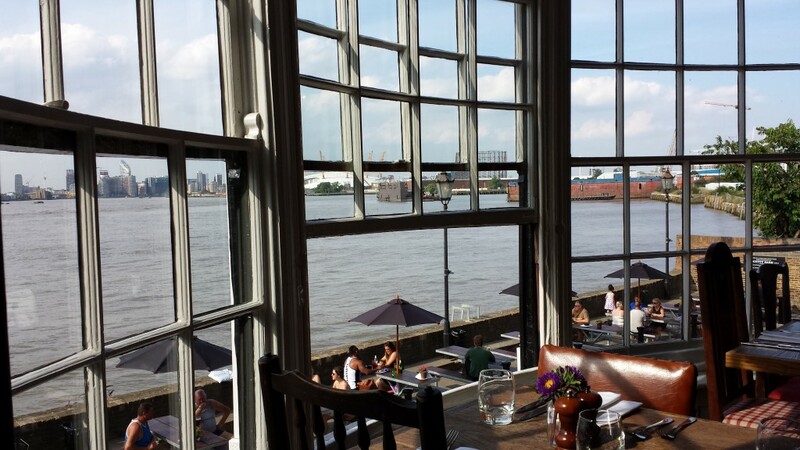 It’s success in the UK stemmed from its strategy of not owning pubs, but selling its unique product to pubs owned by the other major brewers. 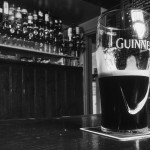 Most casual observers were unaware that the bulk of the shipped overseas came from Guinness’s largest brewer – in London. 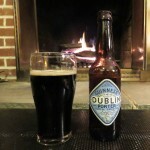 In 2005, however, Guinness closed that brewery and transferred production to a vastly expanded St. James Gate brewery in Dublin. New construction at that plant led to a radical departure from the conservative path they had followed in much of the 20th century. Guinness has dedicated a part of its new brew house’s production to producing beers that are decidedly different from the one size fits all. Iin these days of craft revolution, Guinness has decided simultaneously to dramatically expand variety and go back to its brewing roots. We first encountered a new range of Guinness beers sold in small stores in Nottingham, England. They’ve now crossed the pond and are worth seeking out. 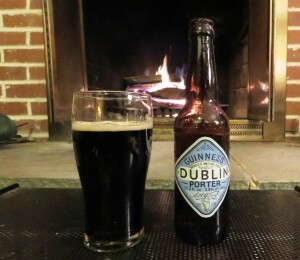 We tasted five of the Guinness stouts and porters in an evening recently. It was an experience we strongly recommend if you’re lucky to find the packages that offer the variety. 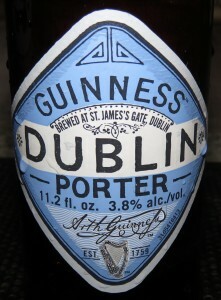 Dublin Porter, Guinness Draft (bottle). 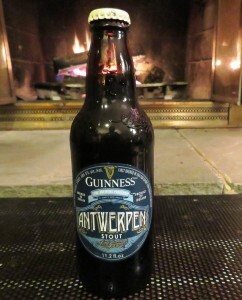 West Indies Porter, Guinness Foreign Extra Stout, and Antwerpen Stout (sold in Belgium as “Special Export”). We’ve had them all before, but the chance to taste them in sequence was a delight. See our “Beer of the Day” blog for our tasting notes on each, but we’ll do some overall comparisons here. It wouldn’t be that hard to write a book on the history and varieties of porters and stouts. You can find much more depth of information than we have space for here on Martyn Cornell’s Zythophile blog. Cornell is one of a small chorus of voices that has changed our understanding of the style and helped to bury a host of myths that were accepted as gospel truth for generations. Porter, as we know it, developed as a commercial rival to the increasingly popular pale ale style. “Stout” started as an adjective – a “stout porter” having more substance, and presumably more alcohol, than the regular one. Somewhere along the way, stout because a noun – a dark dry ale. The current beer revolution has revived more interpretations of the style than the early brewers of it could have imagined. Today distinctions between stout and porter are largely meaningless. This group featured low alcohol porter and stout and relatively high alcohol porter and stout. Any differences in color were imperceptive without a flashlight. The stouts did seem to be a bit drier and slightly less fruity. For fun, we added a coffee porter and a chocolate stout to the table and dug out some notes on a cherry porter we encountered in Germany about a decade ago. (“Porter” is not “bier” and therefore not subject to the Reinheitsgebot. It wasn’t nearly as good as most of the craft beers we’ve sampled lately.) Other than the Cherry Porter, they were all pretty good. The Guinness variety is a walk through history. 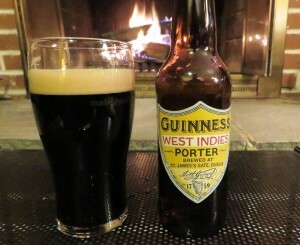 We began our tasting with Guinness’s London Porter, a 3.8 recreation of a beer Guinness claims to have brewed in 1796. It’s a believable “porter” since the term porter originated because of its popularity among manual laborers in the streets of London. Lower alcohol kept them on their feet, while higher caloric contend gave them needed nourishment. The other porter in the series is the West Indies Porter which weighs in at a hefty 6.0%. Higher alcoholic content made the beer sturdier for transport to and consumption in the West Indie and apparently Guinness had established a pretty good hold on the market there by the early 1800s. Foreign Export Stout was first brewed in 1801 and had opened African markets at least by the 1820s. The next two require a big jump in history. The Antwerpen stout is the strongest of the bunch at 8%. It’s the same brew that’s been sold in Europe for half a century under the name of Special Export Stout. They chose the name because they first sold it in Belgium, presumably entering through the port of Antwerp. But it’s a fairly recent entry since the first of it made it across the channel shortly after World War II. Guinness Draft is a variation of the Guinness you’d get in a pub. A huge breakthrough for Guinness began in 1959 when it introduced the nitrogen that created its legendary head. In 1988 it was the first brewery to introduce the “widget” that created a nitrogen head on beer from a can. A widgetized bottle followed in 1999 and that’s the one they chose to put in the mix. 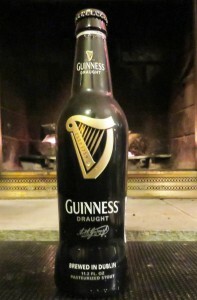 Guinness intends for people to drink it straight from the bottle. We tried it both ways. It’s a smooth beer and drinking from the bottle gives it just a bit more of an edge, but we preferred the smoothness of the glass pour. Guinness isn’t saying right now what’s next but they do suggest there will be more variations forthcoming. We hope their blend of history and innovation continues. 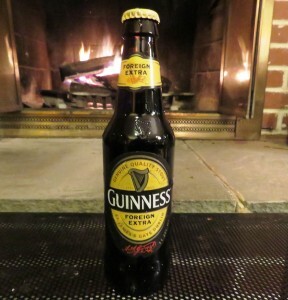 News Flash: GUINNESS WILL OPEN A NEW BREWERY IN BALTIMORE COUNTY! Guinness’s parent company, Diego, has announced plans to open a Guinness Brewery in Baltimore County. It will brew more innovative brews, presumably like those featured in this article as well as out of the box additions to the Guinness lineup such as Guinness Blonde. It will have a tourist center with similarities to the Guinness Experience in Dublin. Located just a couple of miles from the Heavy Seas Brewery, it could be part of a very entertaining beer crawl. They’re using buildings that once produced whiskey, so they expect a pretty quick turnaround with an opening this fall. Guinness dedicated at part of their new Brew House No.4 to producing “The Brewers Project” series. Some of the new creations coming out of this project are based on historic recipes. See our main post for more details. Today’s Beer of the Day is one of the Brewers Project Beers, London Porter, a recreation of a late 18th century recipe. Tasting Notes: Coffee and chocolate in the aroma form a welcome committee. At 3.8% it’s should be a lightweight, but it packs plenty of flavor and a body far more substantial than expected. A clean milky feel ushers in an ashy and dusty finish. Some roasted chocolate and a milky (2%) rather than a creamy feel. There’s just a bit more fruit and less dryness than in the Draft Guinness of about the same strength, and, of course, it has a regular CO2 foam and head. We thought it was an exceptional beer. Ellie the Hop Head remarked “Who needs dank?” as she reluctantly set down the last of the glass. Schwetzingen Hausbrauerei zum Ritter: Beer for Asparagus? Hefe’s not a half bad choice. Coming later today — a tasty trip through the history of Guinness porters and stouts. Schwetzingen Hausbrauerei zum Ritter is an easy train trip from Frankfurt am Main, which is fortunate because Frankfurt remains one of the least interesting of any of Germany’s cities for beer. 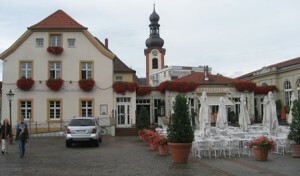 The town of Schwetzingen is probably best known as a center of Spargelzeit – asparagus culture. 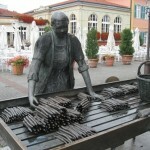 A cast statue of an asparagus vendor occupies a central place in the town square. 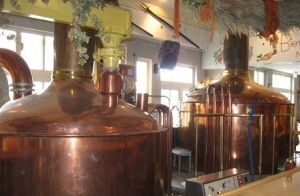 Just past it is the Hausbrauerei zum Ritter which has been providing food and drink to the locals since 1831. Breweries pushing the 200 year mark have often altered appearances so much they’re hard to recognize, but a glance at one of the original photos of the place shows the main building essentially unchanged. 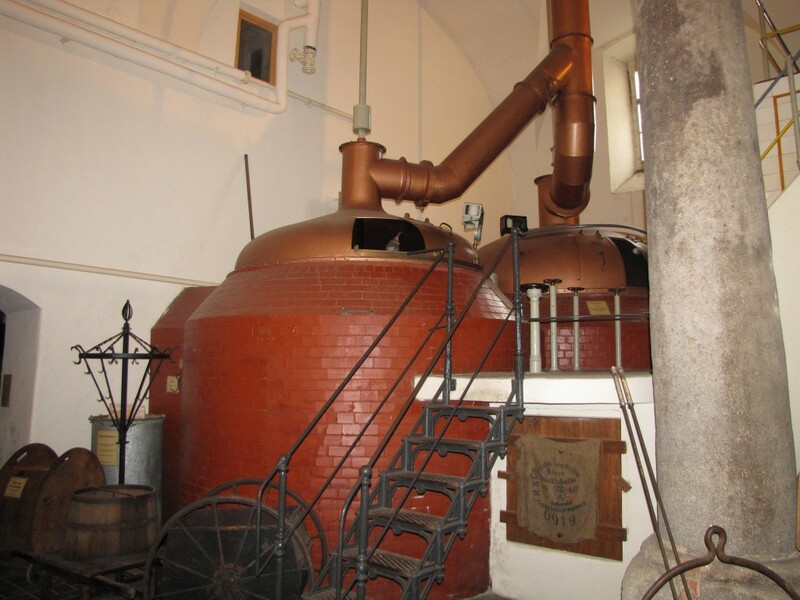 Inside, the shining copper kettles show that it’s been refurbished and brought into the 21st century. 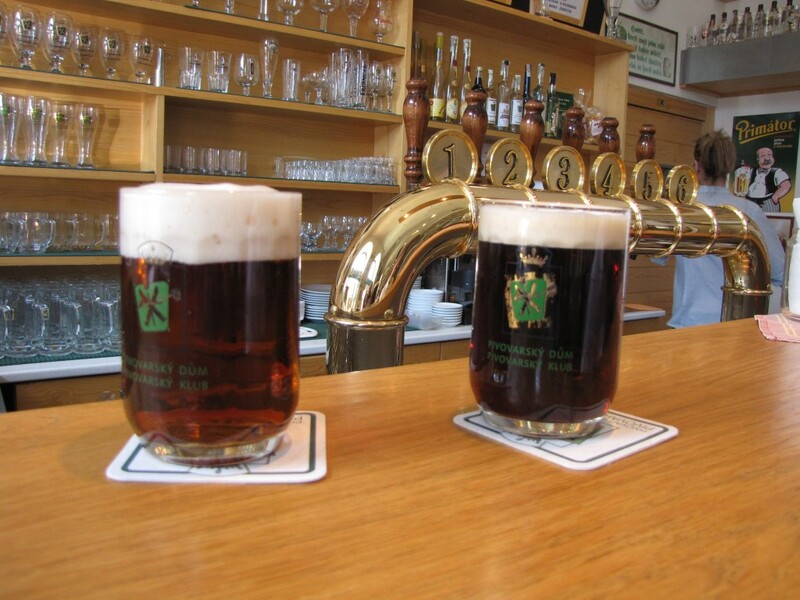 Schwetzingen is a good beer drinker’s town with several brewery taps. It’s one of dozens that didn’t quite make the cut in Drinking In the Culture. We’ve been reviewing German style Hefe-Weizen beers lately and while we’re on that role, we honor the very good example of the style from Ritter. Ritter brews good Helles and Schwarz beers, but their best is Ritter Weizen. The esters are evident but subtle, with a spritzy almost peppery spice more than clove. Banana is very restrained and overshadowed by a Juicy Fruit- Honeysuckle sweetness that’s a component of some German pilsners. A clean chalk feel emanates from a tasty and restrained yeast. 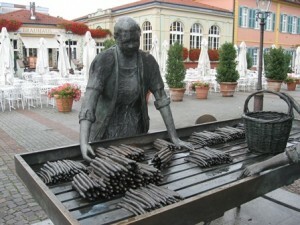 A tribute to the asparagus vendors that make Schwetzingen famous. The Schwetzingen Hausbrauerei zum Ritter shows in the background. We missed asparagus season when we visited and I hope we’ll get back to it. We think that a good German Hefeweizen would be an excellent pairing for asparagus, however, and we’re waiting for spring—the asparagus will be a great deal fresher than the German weisse, but we’re still looking forward to it. We’re pretty sure Amberg has more breweries than gas stations, though not quite as many breweries as churches. Although the number has dropped from just under twenty to five, it’s still a remarkably good town for a couple of days of pub and brewery crawling. 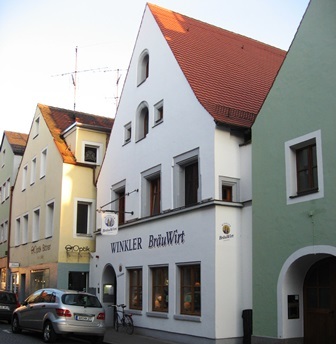 The Winkler brewery has a small restaurant tap room inside the moated area of Amberg. It’s an easy walk to or from the other three central Amberg breweries. It also brews a distinctively different line of beers for the former Schliessl brewery, which still maintains a tap room a short distance away. Yesterday we highlighted the unfiltered Zoigl, which was a rare style when we first encountered it in 2008. Today our focus is on Winkler’s Hefeweizen. 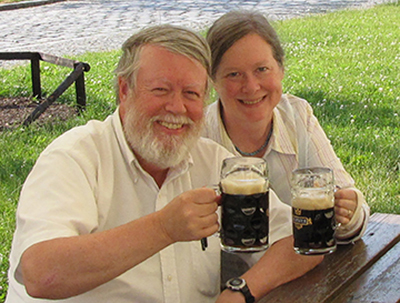 German beers are not nearly as monotonous as some beer geeks claim. You have to be willing to ponder relatively small disparities, but different areas of the country – and even different areas of a state as large as Bavaria—produce variations within styles that are fascinating to ponder. Since a good many of these beers are served in half liter mugs or glasses, there’s plenty of opportunity to meditate on different interpretations of the style. Hefeweizens vary about as much as any of the standard German styles. As we noted in our Hofbräu post a few days ago, they range from fairly sweet with clove and banana, to a drier yeastiness showing black pepper and very little of the banana. Winkler’s version is typical of many in Franconia, sweet with plenty of clove and very evident banana flavors. We prefer the drier, peppery, versions in the south of Bavaria, but we respect the skill that goes into making a hefeweizen like this one. A clean lemon flavor emerges from the wheat, and the lack of filtration allows it to shine. Ellie found a suggestion of bananas Foster in the finish. German hefeweizen beers, by the way, are NEVER served with a slice of lemon. Brewers and tap rooms began to add lemon slices to filtered Kristal Weizens after WWII since filtration stripped them of so much of their flavor. 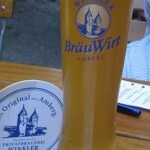 Better techniques mean that today, lemon is unnecessary even for the Kristal (“glass”) Hefeweizen beers. One of the sacrifices we had to make in publishing Drinking In the Culture was that to include over 400 of Europe’s best places to drink, we had to limit how much we said about the actual beers available. The chapter on Amberg is a prime example. We refer to the great small breweries of the town and mention some of the beers, but say very little about them. Our beer of the day, therefore, is one of those small town gems. 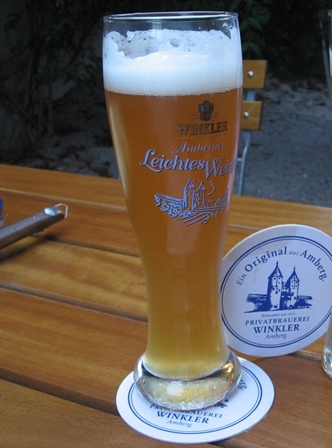 Winkler’s Zoiglbier. We think they are now selling it as Zwickelbier, but we’re pretty sure it’s the same thing we first encountered in 2009. 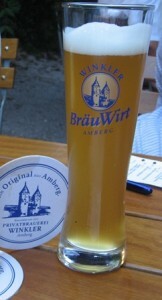 A Zoigl or Zwickelbier is a traditional unfiltered style. Such beers edged toward extinction as 20th century tastes grew blander and clearer. Some small towns kept the tradition alive, however, sometimes brewing only a few times a year and serving them in pubs that were pretty close to private homes. We think the growing popularity of hefeweizen biers opened the door for a number of other unfiltered styles, Zwikel among them. Winkler’s Zoigl is one of Amberg’s best beers. Winkler’s version is sweet, as are most of their beers, but a good example of the style. Some brewers around the world have been slow to realize that an unfiltered beer is better than a filtered beer only if the yeast that makes it tastes good — and not all yeasts do. Winkler is blessed with delicious yeast that plays a major part in smoothing and almost balancing the sweetness. Their Zwickel is a tasting and interesting beer with more color than many of the style, It had a chewy malty depth that echoed hints of a good scotch ale. We haven’t been back to Amberg for a couple of years — reviewing our notes on beers like this reminds us it’s time to return. 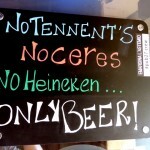 Tomorrow we’ll feature Winkler’s excellent Hefe Weizen.